On Friday night I met some old High School friends for “tennis” (I haven’t played in 10 years or more, plus, I’m still on crutches, so I was the audience) and drinks at the country club. I grew up doing things like this and don’t have much interest in it any more, but I wanted to see my friends and look nice. I pulled this picture of Ellen Pompeo in a J. Mendel blouse out of In Style magazine’s June issue. I thought it was really classy looking. I’m so tired of poofy clothes! I think women over 40 look ridiculous in empire waisted billowy tops and dresses. Unfortunately, the pattern I used for this blouse is a discontinued Style pattern. 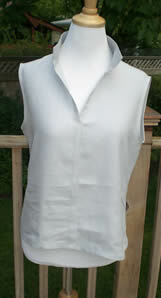 You can re-create the look with any sleeveless blouse pattern. I bought a gorgeous piece of white silk organza with the idea of making a sheer blouse, but I keep whacking off hunks of it and using it as interfacing! 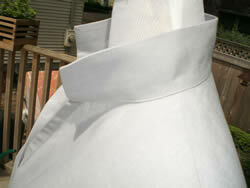 It’s great to use inside light weight fabric when you want some stiffness, it makes my collar look nice and crisp. 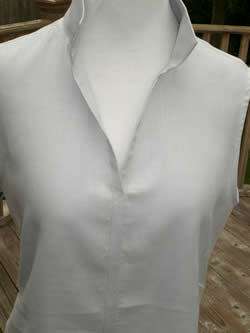 It really turned out great and looks chic and casual with a pair of white pants.